Going on a real African safari in Kenya is a great experience – if you are well prepared! This page explains the basics and gives you some tips and warnings – so nothing will stand in the way of a great safari. Safari means ‘journey’ in Swahili. In the colonial days, a safari meant Europeans going into the bush to hunt wild animals. Luckily, nowadays the guns have been replaced by photo and video equipment, and Kenyan wildlife is being protected through the huge national park system. If you’d like to do an African safari, Kenya is one of the best options. The national parks have been well maintained, there’s an enormous variety in wildlife and landscapes, the country has a well-developed tourist industry which has made even the remote parks accessible for tourists. However, there are downsides. You’ll often have to drive for hours and this is slow and on the often terrible Kenyan roads (unless you can afford to use one of small airlines that fly between the cities and many wildlife parks). And when you’re finally in the park, you’ll keep on driving because it’s usually not allowed (and very unsafe) to leave your vehicle. You’ll drive around – typically two times per day, after sunrise and before sunset – looking for animals to see. And when it’s hot, the roads dusty and you keep seeing the zebras but the darn lion won’t show up… then safari fatigue can set in. How to organize a safari? First of all, the time you make bookings is quite crucial when it comes to the organization of a safari. You can book before your arrival in the country, either through travel agents or directly with safari companies. Do ensure it is a well-established midrange or top end operation, or you risk a low-quality experience or even a scam. Booking in advance ensures that you will be able to secure a spot at the famous lodges, especially during peak seasons. If you really want to get the authentic bush experience, go for at least 5 days on a safari. You’ll have a bigger chance to catch the big animals and the same goes for the chance to spend time with some local tribes people. The short tours can also take you to a quick stop in a tribal village, but such photo-and-souvenir stops can be pretty disappointing, as you’ll often be treated as a cash cow. It is possible to organize your own African safari in Kenya. Most of the national parks are only accessible in a vehicle. You can either use your own vehicle, rent one or simply go to one of the main entry gates of the national parks, pay the entry fee, and try to join up with a group there. A four-wheel-drive is not strictly necessary in most parks (at least in the dry periods) because the unpaved roads (which you usually cannot leave) are accessible to all kinds of cars. Most companies indeed use Nissan minivans, with roofs that can be opened so you can take pictures without glass in front of you. However, if you have to rent a vehicle and other equipment like a tent, then you can just as well go with an organized tour. The costs are roughly the same and being alone, you won’t have backup when your car breaks down in the middle of nowhere. In any case, it’s best to book your African safari in Kenya separately from your flight, hotel, etc. This way you’ll have the most options, and you don’t necessarily have to leave your room while you are on your safari. There are essentially two types of safaris. A budget safari usually means sleeping in tents in open or fenced campsites within or just outside the parks. This is the real bush experience and can be pretty exciting, but don't expect luxury here. It’s quite common for animals to enter the open camp sites at night, so there’s only some canvas between you and the wild animals. Though I know of no case that a human was consumed by a lion or trampled by an elephant, you should be very careful if you have to leave your tent at night. With the second more expensive type, you stay in comfortable to very luxurious tented camps or lodges. You’ll have restaurants, hot showers, wildlife video’s and real bed linen there, as well as plenty of staff taking care of all your needs. Many lodges have waterholes and other tricks to lure the wild animals around dawn and sunset to the lodge or camp, so you can spot them without having to go outside. The advantage of this type is that it’s pretty nice to have a hot bath and meal waiting for you after driving for a whole day on dusty roads. Most safari companies will ask that you pay them in US dollars. The prices of camping safaris have gone up considerably during the last years, mainly due to higher park entry tickets. With a camping safari, you should reckon with a minimum cost of $75 - $100 per person per day, including park entry fees, a car with driver and cook, 3 meals a day and the hire of equipment (though there’s often an extra charge for hiring sleeping bags and for the booze in the evening). Sleeping bags may cost you an additional $10-$15. If you stay in tented camps or lodges, prizes are roughly between $250 - $350 per person per day. Above that, there’s the real luxurious safaris where the clients fly in with a chartered jet, and then the prizes hit the sky. For top-end safaris in very luxurious places, prices usually range between $250 and $600 or more per person per day. 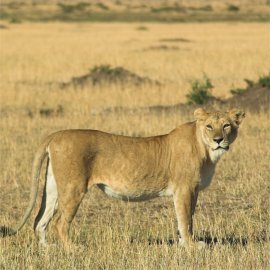 There are lots and lots of safari companies available if you want to book an African safari in Kenya. Sadly, they aren’t all good. Some of them deliver bad service and others will really try to rip you off. 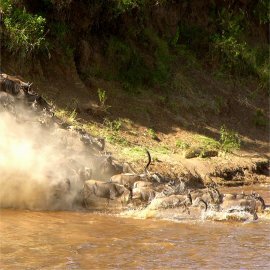 More information is on my special page on how to choose the best company for your safari tour in Kenya. Each park has it’s pros and cons. One thing to keep in mind is, the more abundant the vegetation is, the harder it is to spot animals as they hide in the bush. So while some parks have a beautiful scenery with thick bush, other parks with less versatile plains offer much better possibilities for wildlife viewing (called game viewing or game drives in the jargon). Of course, there are also big differences between the animals present. Secondly, some parks are much more crowded than others, because they’re more popular or closer to Nairobi. Especially crowded are Masai Mara and Amboseli during the tourist high season (July-August and December-January). On my introduction page to the Kenyan national parks, and additionally on my facts page about each of the major national parks, you can compare the parks on all these points and make your best choice. A third thing to keep in mind, especially when you have more parks in your itinerary, is the distance between the parks. They are often so bad that you can’t go any faster than 20-30 miles an hour, and still you’re shaking like crazy. You don’t want to spend your precious safari days driving on the often terrible Kenyan roads. Game drives are only done in the first hours after sunrise and the late afternoon – in the middle of the day many animals are asleep. This can limit your schedule. Here’s my page about the best season for an African safari in Kenya. What clothes and stuff to bring? Read here which clothes and other stuff to bring on a safari. So What Kind Of Kenya Wild Safaris Are There? What’s the best season for an African safari Kenya? What to bring on an African safari?